Ok, disclaimer. Not of fan of 90% of “Christian fiction” (imagine that I just made those quotations in the air with my hands” and possibly even a gagging sound). It is often too sweet and sappy and unrealistic. But maybe, just maybe a mom of three with a nose ring can do it right. Within less than a dozen pages I was hooked. Instead of going to bed at a respectable hour, or doing the dishes or grading papers……I found my self in the middle of Defiance, TX. Mourning with Emory of the loss of her daughter Daisy. Hoping with Hixon that he will manage to win Emory’s heart. Wishing for Emory to finally come around. Praying that Jed would survive under all the weight of his self-imposed guilt. Wondering if Ousie would stand up to or be crumpled by the hand of her husband. And most of all wanting to find out who the killer is. And that is just the first few chapters. 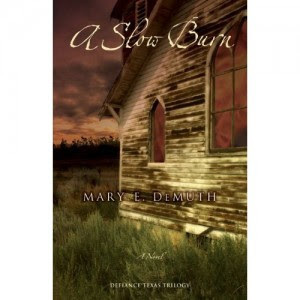 In other words, A Slow Burn, is anything but a slow read. So, let the dishes pile up. Let some one else put away the laundry and be prepared to stay up into the wee hours with this one. This book can be dark, with themes of loss, guilt, abuse and addiction. But you are not left in the dark ( well, except all those tidy little answers that I hope to find in book 3!). In even the darkest of moments are patches of hope and grace that are enough to shine light on God’s bright and amazing love. Enough hope that somehow, you end up rooting for and wanting redemption even for the shadiest of characters. One final question for our author Mary DeMuth, and surprisingly it isn’t who dunnit, but…….. When does the final book in this trilogy come out? Thank you so much for walking through Defiance! I'm humbled!